My office recently had a visit from Jessica Yaniw of Grey Highlands Fire & Emergency Services to remind all of the agents of the importance of working smoke alarms and carbon monoxide detectors and I thought the information she presented was well worth sharing. Smoke alarms and carbon monoxide detectors are not only safeguards, they’re life savers! 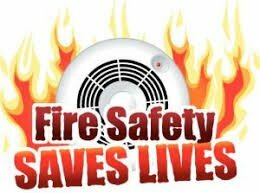 The Ontario Fire Code requires every dwelling to have working smoke alarms on every level and outside sleeping quarters. 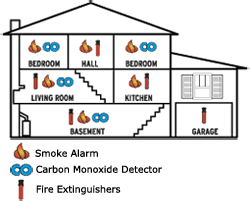 The Ontario Fire Code requires every dwelling with an attached garage or fuel burning appliance to have a working carbon monoxide detector outside sleeping quarters. Regularly testing your alarms (recommended once per month) will ensure they are functioning in the event of a fire emergency. Age matters when it comes to smoke alarms and carbon monoxide detectors. Check the date of manufacture on the back of your alarms. 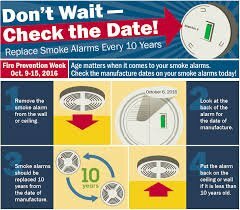 Smoke alarms should be replaced every 10 years while CO detectors generally last 5-7 years from the date of manufacture. If you cannot locate the date of manufacture, the alarm seems broken or the plastic has yellowed, it is best to replace the alarm. Use this weekend’s time change as an opportunity to change the batteries in your smoke alarm at daylight savings time. Connecting a mental association between resetting the clocks and changing the alarm batteries will make it easier to remember to complete this important task. Test all alarms each month. If you don’t get an immediate response, replace the batteries or consider replacing the unit. Develop a home fire escape plan and practice it with your family. Everyone should know the fastest way out of the house in the event of a fire emergency. Homes today burn up to 8 times faster than 50 years ago. You may have less than 60 seconds to escape a fire in your home. On average, a working smoke alarm can detect a developing fire in as little as 15 seconds! That’s the incipient stage of a fire, well before the environment becomes toxic. Smoke and fire spread quickly, doubling in size every 30 seconds, which means early detection and prompt evacuation are key to survival. Smoke alarms can increase your chances of surviving a fire by up to 50%. In 1 out of 3 fatal home fires, no working smoke alarms are present. Proven Results and Award Winning Customer Service!